Greetings Area 1 Handbell Musicians of America! 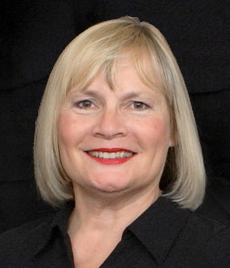 I am honored to be writing to you for the ﬁrst time as chair of Area 1 – “where it all began.” Your newly elected officers assumed their new positions on July 1, 2013 – JEAN DEGAN is now Past Chair, I am the new Chair, and MARTHA GOODMAN is now Chair-Elect. SUE CHAMBERLIN will continue as Treasurer for the next two years, and our new Secretary is JOAN FOSSUM. Please join me in thanking our outgoing board members for their service to Area 1. GRIFF GALL had the unenviable position of assuming the chair position after only a very short time as chair-elect when Patrick Gagnon moved to Area 8. Griff has led our Area admirably the past several years and also proudly represented Area 1 at several National leadership events in the education arena. 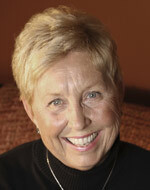 NORAH PIEHL leaves the board after four years as secretary. Norah brought her professionalism and outstanding communication skills to this position and has set an admirable standard for those who will follow her. We congratulate Norah on her marriage earlier this year; and, this autumn Norah and her husband will welcome a new bell ringer to their family! Dan has worked tirelessly to further handbells in Area 1 for many years and continues to be a guiding force for our Area and its members. Congratulations, Dan! Add in the wonderful mini-concert performances and great food, and it was one world-class event! Kudos to Co-Chairs BILL NOSS and DAN MOORE and their team of volunteers who all worked very hard to ensure a successful event. And a special thank you to Bill Noss, who, in the middle of planning Festival 2013, moved to Georgia but continued as co-chair even from that distance. Modern technology makes so many things possible! FESTIVAL/CONFERENCE 2015 will take place June 25-28, 2015, at UMASS Amherst. KIM STREPKA, who was to chair that event, has unfortunately moved from Area 1 due to an employment change for her husband, but she has laid the groundwork for a successful event, and I am pleased to announce that PAUL CONTRASTANO has volunteered to chair F/C 2015! Paul has been the vendor liaison the past several festivals, and will bring his organizational skills to F/C to ensure a successful event. We are still in the process of securing our directors and opening concert but should have that firmed up in the next few months. Stay tuned to this station for the exciting details! JEAN DEGAN, GRIFF GALL, KAREN LEONARD, KRISHNA ERSSON, EMILIE STEINNAGEL, and I have just returned from the NATIONAL SEMINAR in Portland, Oregon. Krishna and Griff represented our Area well by teaching several classes during the event. 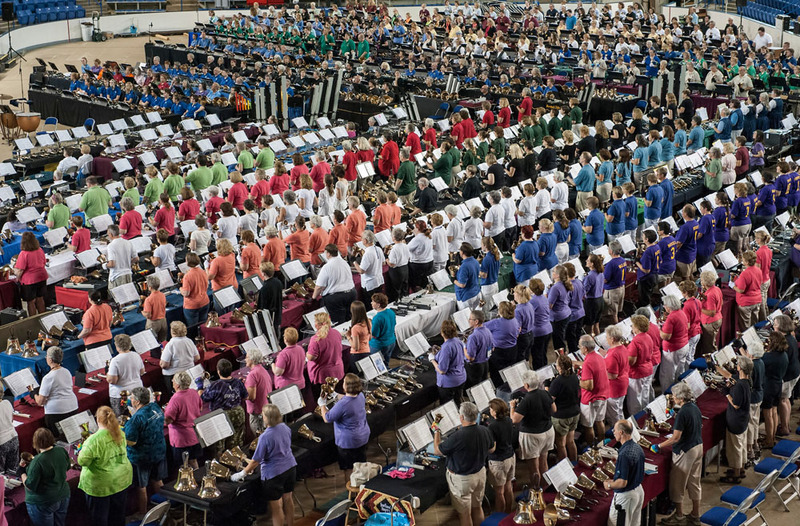 Attendance at this gathering was at an all-time high, and we were treated to world-class concerts and outstanding education opportunities taught by the best in the handbell world. I would encourage you all to consider attending a national event – you will come home so inspired and energized. Next summer’s National Seminar will be in Atlanta on July 15-18. Also, PINNACLE, a National event for ringers, will return in 2015 (location to be determined). There are scholarship funds available for each of these events from the National and Area levels. Mark your calendars and plan to join some of your fellow Area 1 members next year in Atlanta and beyond. For information on the scholarships available, please see the Area 1 website and the National website. And one final event of note – the biannual INTERNATIONAL SYMPOSIUM will be held next August in JEJU, KOREA; this is a wonderful opportunity to meet handbell ringers from all over the world. More information will be added on the National website over the next several weeks. On the National level, many of you are aware of the implementation of the new membership structure. One of the benefits of this change is a return of a portion of each member’s annual dues to the Area to fund future activities, a change that we in Area 1 have advocated for over a period of many years. Another change in the membership structure is a new Sub-Membership, which is for an individual member of an organization that has an existing Handbell Musician Membership. This is a wonderful opportunity for the ringers in your group(s) to enjoy some of the benefits of a regular membership for just $10 per year. Each person with this membership will enjoy access to online resources through a separate ID and password, as well as the online edition of Overtones, E-Notes, and Event Notes. So take the opportunity for your ringers to become more active and informed!!! More information on membership options can be found at National website. 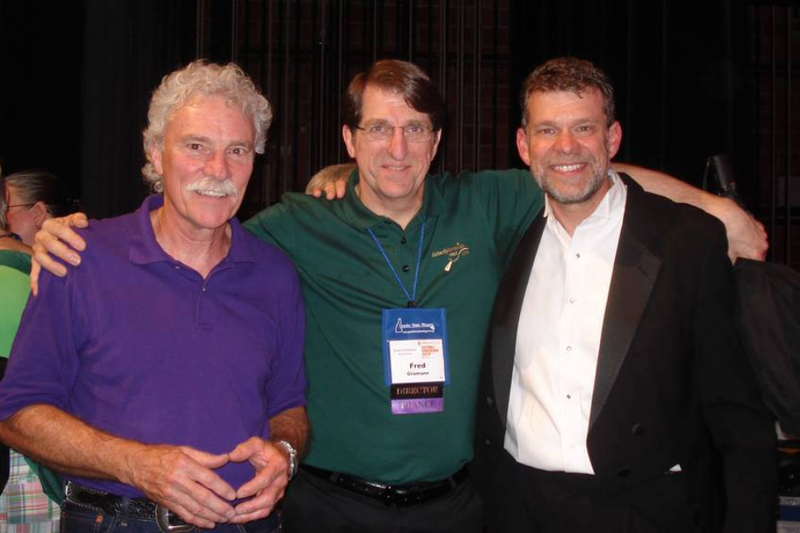 Upcoming events in our area include the HIGH SCHOOL RING-OUT on November 9 at Wheeler School with JASON KRUG as the clinician, and DIRECTORS SEMINAR at UMASS Amherst on January 31-February 1, 2014 with BILL ALEXANDER as clinician. Look for the return of our SKILL BUILDING WORKSHOPS this fall and next spring also. I look forward to working with you over the next few years and meeting as many of you as possible at various events. Our doors are always open – we want to hear from you with questions, concerns, suggestions, etc. Feel free to contact me or any of our other Board members. All of our contact information can be found at our Area 1 website. Photo 1) Festival Directors Hart Morris and Fred Gramann and The Raleigh Ringers’ Dave Harris; 2) Hart and Fred; 3) some of the 600+ ringers during our Closing Concert on Sunday. You can see more great pictures on Area 1’s Facebook page. Like our page and receive the latest updates on events and news. What a wonderful handbell event was held in Ocean Park on June 25th. THE RALEIGH RINGERS presented an awesome concert to a very enthusiastic crowd of handbell ringers from Maine and the surrounding areas. This was RR’s first visit to Maine, and David Harris, the conductor, made a point of mentioning the enthusiasm and energy that was exhibited by the audience. In addition to performing, Raleigh Ringers had a few hours to explore Maine on their first ever visit here. They shopped at the Old Port in Portland and had the opportunity to visit Portland Head Light in Ft. Williams State Park. The morning after the concert, a stroll on the beach at Old Orchard was taken by just about all 20 RR members and, of course, freshly baked cinnamon rolls from the OCEAN PARK DELI was on the breakfast menu. As we said goodbye, I knew we had made some new friends in Maine. Two days later, I attended the Area 1 Festival/Conference held at UNH on June 27th, along with other Directors and Ringers from all over New England and other states, as well as Bermuda. The workshops were excellent and, of course, the concert on Sunday, with 650 ringers playing in the UNH Hockey facility was amazing. Next on the agenda in Maine, is to move ahead on planning the SPRING RING. If anyone has information on how that is going, please contact me. I would be happy to support that effort in any way I can. And finally, the Area 1 Board of Directors will be meeting in September so if you have any ideas or issues you would like addressed or thoughts on how “The Guild” can be supportive or helpful in new ways, please let me know. You can email me at me.area1@handbellmusicians.org. Your state has been well-represented at all Area 1 Board Meetings, held generally in January, May, and September of each year. State reports are prepared, distributed in advance, and active discussion is encouraged at each meeting. Again, Massachusetts has been a regular contributor to issues of the Fundamental Tone, published generally in February, May, August, and November of each year. In addition to news from your State Chair, several handbell groups from around the Commonwealth have offered newsworthy items of general interest, published in appropriate issues of the Fundamental Tone. Considering this was a great way for any Guild-member handbell group to communicate across our state, I’m happy to note that items came from school-based, church-based, and community-based groups. What does clonewear mean? You’re welcome to submit your definitions to me. Are you interested in working on the next MA Spring Ring committee? Email your notes of interest to me. just can’t get ENOUGH of handbells!! This rep reading will introduce ringers and directors of all levels to a wide selection of holiday handbell music in the spacious modern sanctuary of St. Matthew’s United Methodist Church. Participants will enjoy playing various pieces and getting suggestions for their holiday repertoire. We will also offer selections for smaller ensembles for handbell groups with less than the standard number of ringers. Music will be available for purchase. Please join us for an exhilarating morning — a continental breakfast and snack will be served. The 14th annual Area 1 High School Ring-Out will return to Wheeler School on Saturday, November 9, 2013 from 9:30 am to 4:00 p.m. Dan Moore and the ringers at Wheeler School invite all Area 1 youth ringers and choirs to participate in this exciting and growing event. The day will include rehearsals with an exciting guest director, BYO lunch, a closing concert with an opportunity for individual choirs to present solo pieces and plenty of time to get to know other ringers. Enthusiastic, fun group of 11 handbell ringers are seeking a new director to take them to new heights. Five octaves and chimes, playing up to level 4 music. Weekly rehearsals, monthly playing in worship (traditional and contemporary), a Christmas Concert (8-10 pieces) that draws 400 in two concerts. Will also revitalize an intergenerational group and a youth group designed to prepare ringers for more difficult music. I wanted to take a few moments of your time, if you’re reading this that is, and thank you for all the great times I’ve had in Area 1. You may know by now that my wife Linda and I moved to Georgia (Area 4) last fall. This is the last issue of Fundamental Tone I’ve promised to produce. Fundamental Tone has always been a labor of love and I loved learning all about Area 1 and its people. A huge plus was getting to know all those who help make sure things keep the Area running smoothly, and, most importantly, learning to ring handbells with all of you. 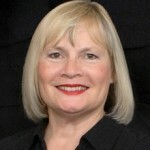 Linda was also active in Area 1, and I can tell you honestly that we miss our friends and fellow ringers in New England. You can never be replaced. As I said from the podium at Festival, Area 1 is the best area in the U.S. I will let you know if I ever find out differently. I have not seen the inner workings of another area yet, but I have heard their challenges, and I want you to know that what you have is the best. A lot of this has to do with the small area that Area 1 covers in size: most everyone can attend a couple or more events every year within a couple of hours from their home. And, Area 1 is “where it all began,” so we expect to know more and have more enthusiasm. But mostly, it has to do with the people: those who run the events, who serve on the board and those that attend the events to increase their ringing knowledge. I am sure people in other areas love their handbells almost as much as Area 1’ers, but we get together more often, in larger groups, and I think, have the best instructors/teachers/mentors around. 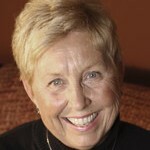 Please know that Linda and I will miss you. But expect to see us at future ringing events or performances or Area 1 Festival/Conferences…there’s still nothing else quite like them.